Pipeline capacity constraints out of the Permian have loosened recently and should continue to improve as new and expanded pipelines come on-line. Export capacity on the Texas coast is unlikely to be constrained over the next two years due to a surplus in existing capacity and planned capacity additions in 2019. Over a longer time horizon, export capacity could be overbuilt, though this will depend on which proposed projects reach a positive final investment decision (FID) and are ultimately constructed. Last year, the rampant growth in crude production in the Permian caused supply to outpace available pipeline takeaway capacity, creating a growth opportunity for the midstream space. As new pipeline capacity comes on-line in the Permian this year and in 2020+, the logical question is whether the bottleneck will simply move ~500 miles east to the Texas Gulf Coast. Today, we compare Permian pipeline takeaway capacity with Texas Gulf Coast export projects to determine if crude exports will be constrained over the next few years. Pipelines to the rescue to alleviate Permian crude constraints. 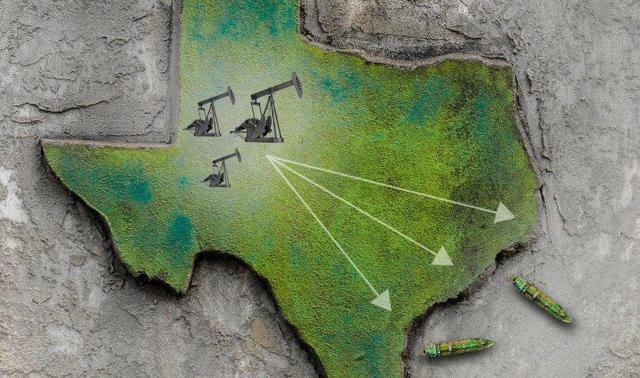 At the risk of stating the obvious to most readers, the Permian is a big deal and has garnered international attention for its robust production growth. Its January 2019 crude output of 3.8 million barrels per day (MMBpd) was an increase of almost 1 MMBpd (+35%) from the same month in 2018. To further frame the Permian's importance, only two OPEC members produced more oil than the Permian in January 2019, Saudi Arabia at 10.2 MMBpd and Iraq at 4.7 MMBpd. The steep growth in Permian production quickly overwhelmed pipeline takeaway capacity last year, causing widened discounts in regional oil prices and making the basin the poster child for what happens when supply overwhelms pipeline capacity (read more). The good news for Permian producers is that crude differentials have improved with added pipeline capacity and in anticipation of more capacity coming on-line. In fact, Midland crude traded at a $0.60 per barrel premium to WTI Cushing as of February 15. One recent development was Plains All American's (PAA) expanded Sunrise Pipeline being placed in service ahead of schedule in November. This month, Enterprise Products Partners' (EPD) Seminole NGL pipeline conversion to crude service will begin limited service. Additionally, in the second half of this year, EPIC will finish its temporary conversion of a portion of its NGL pipeline to crude service, and PAA will place the first leg of its Cactus II pipeline in service. Over 3 MMBpd of Permian crude pipeline capacity is expected through 2022. While Permian producers may be celebrating improved crude differentials, the big story from a midstream perspective is the deluge of crude pipelines being built over the next few years. In total, we estimate 3.4 MMBpd in takeaway capacity being constructed through 2022, based on projects that have reached final investment decision (FID)1. We excluded the Permian Gulf Coast (PGC) pipeline, since it has not reached FID, but would note that management teams involved with PGC have signaled interest in potentially combining with the Wink to Webster pipeline. How does pipeline capacity align with production growth? 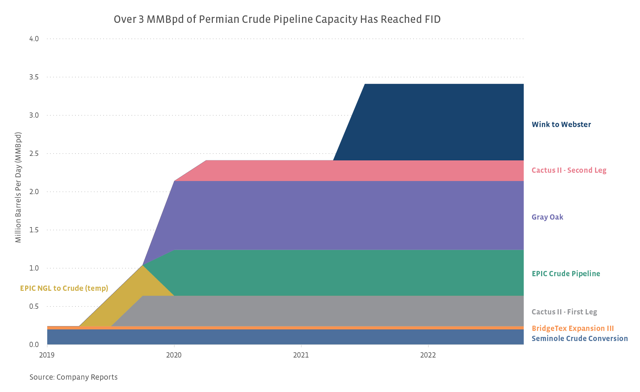 The EIA forecasts Permian production of 4.8 MMBpd by the end of 2020 ­- implying 1 MMBpd of growth from January 2019 - compared to 2.4 MMBpd of incremental pipeline capacity expected on-line by the end of 2020. If we assume production growth is double the EIA estimate, there should be comfortable takeaway capacity even with 85% pipeline utilization. For a long-term view, Plains All American forecasts Permian oil production will exit 2023 between 6.1 and 6.8 MMBpd as per its recent presentation. Combining January production with PAA's estimate, the implied growth would be 2.3-3 MMBpd, in comparison to 3.4 MMBpd of nameplate capacity. Implied growth would, therefore, be 2.9 MMBpd if we assume 85% utilization. If production comes in at the high end of PAA's forecast or surprises to the upside, the Permian could again face pipeline constraints if only the projects in the chart below are added. Is the crude glut just moving to the coast? With Permian crude pipeline capacity set to increase significantly, the question is if midstream is fixing one bottleneck just to create another one on the Texas Gulf Coast. One potential destination for Permian crude is Texas refineries, but their complexity is a limiting factor in their ability to run light, sweet crude. In general, to balance crude supply and demand along the Gulf Coast, incremental barrels will need to be exported. Several crude export projects have been announced in conjunction with pipeline additions from the Permian. In 2019 alone, two new export terminals will come on-line along with three expansions, for total incremental export capacity of 1.6 MMBpd in Houston and Corpus Christi. A joint venture that includes Buckeye Partners (BPL), Phillips 66 Partners (PSXP), and Marathon Petroleum (MPC) is constructing the South Texas Gateway Terminal in Corpus Christi, which will start up 400 MBpd by the end of this year. Magellan Midstream Partners (MMP) and LBC Tank Terminals are also expanding their Seabrook crude terminal by 400 MBpd by the end of 2019. Will export capacity be constrained? We don't think so. In its recent presentation, PAA puts US Gulf Coast crude export capacity at 7 MMBpd, in comparison to recent exports of just over 2 MMBpd. We conservatively estimate Louisiana export capacity, with exports primarily located at the Louisiana Offshore Oil Port (LOOP), at somewhere between 1 and 1.5 MMBpd. To be conservative, if we assume Louisiana export capacity is 1.5 MMBpd, Texas export capacity is implied at 5.5 MMBpd. 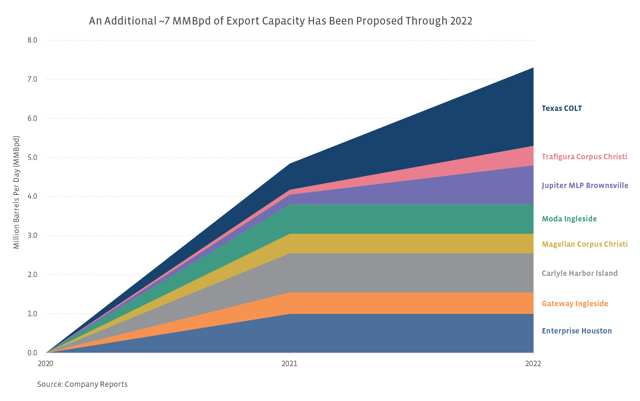 Export terminals are unlikely to operate at full capacity, so if we further assume 70% utilization for the existing and planned capacity additions over the next two years, that would give us ~5 MMBpd of operable export capacity plus any incremental refinery demand. 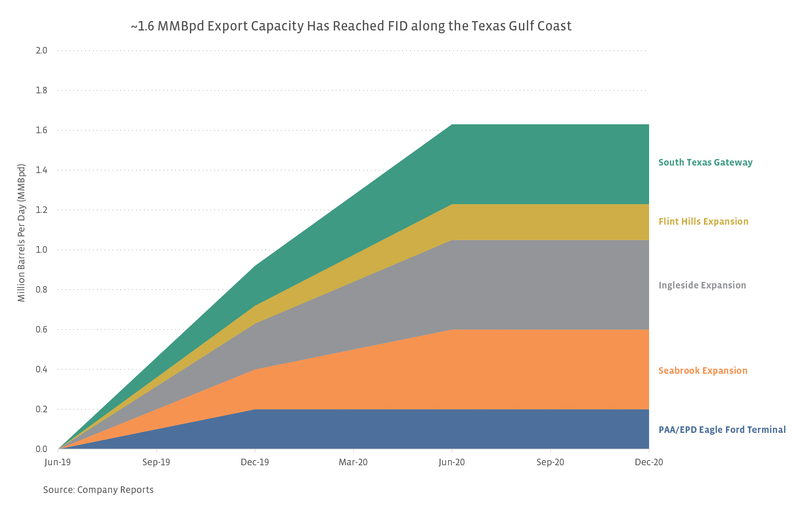 Given that current exports of 2 MMBpd from the Gulf Coast include both Texas and Louisiana, and assuming 85% utilization on pipeline additions of 2.9 MMBpd (independent of production growth), there should be sufficient export capacity on the Texas Gulf Coast. Based on these numbers, it's hard to see a sustained bottleneck forming based on inadequate export capacity. Construction of all export projects could lead to an overbuild. The number of announced export terminal projects makes an overbuild possible in the long term, but that also depends on expectations for supply from the Permian (primarily) and the Eagle Ford. Through 2022, up to 8.9 MMBpd of export capacity could be constructed when combining projects that have reached FID and all proposed export projects. Importantly, many of the announced new-build and expansion projects have not reached FID, including large undertakings such as Carlyle and the Port of Corpus Christi's Harbor Island project, Jupiter MLP's Brownsville terminal, and the Texas COLT terminal in Freeport being developed by Enbridge (ENB), Kinder Morgan (KMI), and Oiltanking. At this time, it is uncertain whether all these projects will reach FID. Revisiting production growth, if we take the midpoint of PAA's 2023 exit rate forecast for Permian production, the implied growth would be 2.65 MMBpd from today to the end of 2023. Assuming 70% utilization of planned and proposed terminal capacity additions, the implied surplus in export capacity would be 3.6 MMBpd if all projects came on-line. As a result, it seems possible some projects will get scrapped or combined before reaching FID. That said, it bears mentioning that new-build projects may have competitive advantages over existing capacity. For example, the ability to load Very Large Crude Carriers (VLCCs), which can carry 2 million barrels of crude, may result in a more cost-efficient export option than existing capacity that is limited to smaller ships. The immense production growth in the Permian is creating opportunities for midstream companies. Higher crude volumes have increased the need for additional pipelines and the expansion of existing lines as well as new export terminals. Crude export capacity on the Texas coast is unlikely to be constrained over the next two years due to a surplus in existing capacity and several upcoming projects and expansions. Over a longer time horizon, it's possible an overbuild of export capacity could develop if most proposed projects are ultimately built, but more likely, we will see project combinations or decisions not to pursue some projects. 1 A final investment decision is the point at which a project shifts from initial planning and permitting to actual construction of infrastructure. 2 Bloomberg reported in early December that LOOP would load 3 Very Large Crude Carriers (6 MMBbls) in one week, which would equate to ~860 MBpd. Efficiency for loading VLCCs has improved, and LOOP exports will be somewhat dependent on LOOP imports. In other words, capacity is somewhat of a moving target.